Michel Barnier has said Theresa May's plan for a future trade relationship with the EU could weaken the single market and create burdens for business. The EU Brexit negotiator said the White Paper opened "the way to a constructive discussion" but must be "workable". He questioned whether UK plans for a common rulebook for goods and agri-foods were practical. Earlier, Theresa May urged the EU to "evolve" its position on Brexit and not fall back on unworkable proposals. Mrs May is hoping the White Paper - which sparked two cabinet resignations - will allow the two sides to reach a deal on post-Brexit relations by the autumn, so the UK can avoid leaving the EU without a deal in March next year. The White Paper proposes close ties in some areas, such as the trade in goods, but Mrs May says it will end free movement and the jurisdiction of the European Court, and allow the UK to strike trade deals with other nations. Mr Barnier did not reject the White Paper out of hand, saying "several elements" of it were "very useful". Media captionTheresa May was speaking during a visit to Northern Ireland on Friday. But there were parts that Brussels did not understand which would need further clarification. He said his main aim was to protect the integrity of the EU single market, and the UK proposals - which would see frictionless trade in goods but not services - risked undermining that. "We are not going to negotiate on the basis of the White Paper because that's the British paper but we could use many elements of the White Paper," said Mr Barnier. "There's not an awful lot of justification for the EU running the risk of weakening the single market. "That is our main asset. There's no justification for us to create additional burdens on business just because the UK wants to leave." Mr Barnier questioned the UK's plans for a "common rulebook" for EU-UK trade as it only referred to goods checked at the border, not areas like pesticide use, adding: "How can we protect consumers in Europe?" He also questioned whether the plans were workable without additional bureaucracy and said there were "practical problems" about how tariffs would be determined and collected - under the UK's plan, EU member states would collect tariffs on the UK's behalf and vice versa. 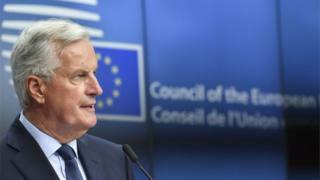 But Mr Barnier suggested the EU's controversial "backstop" proposal aimed at avoiding a hard Irish border could be changed: "There will be a deal if there is an agreement on the backstop. "It's not necessarily our backstop. We can work on this, amend it, improve our backstop ... But we need an operational backstop now, in the Withdrawal Agreement, and not later." 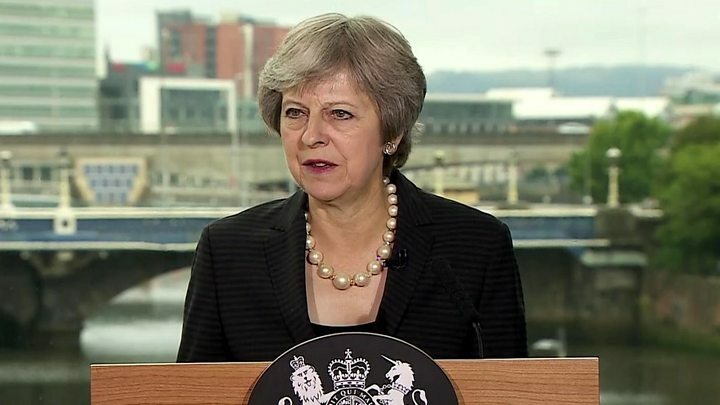 On a visit to Belfast on Friday, Theresa May said the "seamless border" between Northern Ireland and the Irish Republic was "a foundation stone on which the Belfast [Good Friday] Agreement rests" and the concept of a hard border was now "almost inconceivable". But she reiterated her opposition to the EU's "backstop" proposal, that would see Northern Ireland effectively staying in the single market for goods and the customs union, as "something I will never accept and I believe no British prime minister could ever accept". And she dismissed suggestions made by former foreign secretary Boris Johnson that technology could be used to avoid the need for a hard border: "No technology solution to address these issues has been designed yet or implemented anywhere in the world, let alone in such a unique and highly sensitive context as the Northern Ireland border." She said the White Paper was a "significant development" of the UK's position and offered a "coherent package". "It is now for the EU to respond - not simply to fall back on to previous positions which have already been proven unworkable, but to evolve their position in kind. Ireland's Foreign Minister Simon Coveney told Ireland's RTE radio there had been a "lukewarm" response in Brussels to the UK White Paper. He added: "We don't have any British proposal in terms of a functioning backstop in its entirety. We have bits and pieces of ideas."